Jonathan Swift (1667-1745) was an Irish novelist, satirist, poet and political essayist. From a very literary family, his uncle married the daughter of a godson of William Shakespeare, Swift was very well educated, receiving an MA from Oxford University and a Doctorate in Divinity from Trinity College in Dublin. An ordained priest in the Established Church of Ireland, Swift began writing satire, inspired by his misery in his profession. Politically active, Swift incurred the enmity of enough British nobles, that his career as a minister was over. Swift began writing novels, while also writing political phamphlets promoting Irish causes. 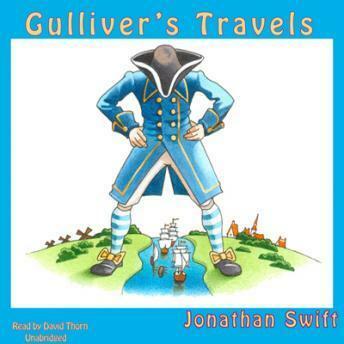 Swift's best know work, Gulliver's Travels is filled with satiric references to his current events, and was an immediate hit, written anomously, it had to be smuggled into Ireland. The Queen was not amused. Written about 300 years ago this story has aged very well and Gulliver's adventures are event today very entertaining. Gulliver's Travels was meant to mock the hordes of books about adventurous travels released at the time which often exaggerated the dangers faced and the belitteled the intellect of the natives encountered. And so Gulliver meets giants, tiny people, horses which rule over men and people living on a floating island. In addition to the entertainment value these episodes hold it is also very interesting to see how critical Jonathan Swift was of English society and values. This criticism is never voiced by the main character directly, but surface through the discussions Gulliver has with the people he meets. The Audiobook version published by Alcazar AudioWorks features a terrific Narrator which makes the story a joy to listen to. This book is written with wonderful prose and read by a very talented narrator. When I first started the book it was a wonder to sit back and just listen. The story is very imaginative as well. This must be a very early example of the fantasy genre. This is one of those books that people love to talk about but never actually read. At most they read the cliff notes version but let me tell you, you're really missing out on a jewel if you do. The unabridged version is the only way to go and this one does an excellent job. It leaves you with conversational pieces, insight into humanity and culture that you would not have had otherwise. Not to mention that just sticking with the abridged or cliff notes you get the ""official"" interpretation but you lose the opportunity to think for your self on the dilemmas presented. The story basically follows the adventures of one guy who ends up shipwrecked on 3 different islands and with each island is presented with a unique situation. One where he ends up a giant, one where he ends up a miniature and one...well...you'll just have to find that one out for yourself. I had to do a school project about Gulliver's Travels, so naturally audible was my go-to destination. At a low price and high quality, this version was a life-saver! The narrator did a wonderful job bringing Swift's witty social commentary to life, and is (in my opinion anyway) one of the best readers of this book. If you thought you knew Gulliver, get ready for delightful new discoveries, from the flying island of Laputa, to the island of the Houyhnhnms. With remarks just as pointed today as they were when this book was first written over 300 years ago. If you're ready to travel with Gulliver, this is the version you want!